I kind of fizzled out halfway through August on my NaBloPoMo effort. No particular reason why, I just quit writing. I could make excuses – work was a bear, I was tired, I was busy, the cat scratched my eye, I was lazy (all of which are true), but I won’t. Because most of those things (with the exception of the cat scratching my eye) were true when I was posting everyday. So, I just didn’t post. No excuses. I’m going to try again for September…the key word is try. Maybe I’ll make it further than August, maybe I won’t. Who knows. Only time will tell. The theme this month is Lessons, and today’s prompt is: It’s back-to-school time: do you love the start of school or dread it? It’s kind of a mixed bag for me. Personally, I don’t have kids, so the start of school doesn’t have an effect on me that way. However, I work at a school, so the start of school means the start of my job (I’m on basically the same schedule as the students – I get summers off, although I start back a few weeks before the students do). I do like the start of school, during registration and that first day back with students. Seeing how students have changed over the summer, seeing who’s back and who’s not. Now that we’re in our 5th week (we started July 30), the start of school is a distant memory and I’m looking forward to the start of break. 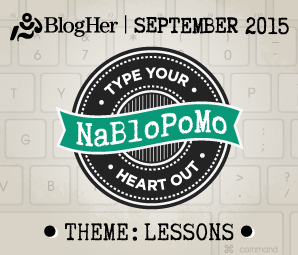 My answer to today’s NaBloPoMo prompt is one word: yes. The prompt is Do you believe knowledge is power? I could stop today’s entry there, since I’ve answered the question, but I won’t. I’ll ramble. You’ll probably be bored. But, I’ll ramble anyway. The weekend was hectic. We didn’t really do anything super productive, but it was still busy. We both have to buy nicer clothes for work (as opposed to the jeans and tops I’ve been wearing, and his tshirts for working on the train), so we went out on a search for clothes. There aren’t many places to search in town, so it didn’t take long. After shopping, we had lunch, stopped at the music/book/movie store, and then headed home. Spent the rest of the day doing nothing. We did watch (on TV) the Kansas City Chiefs (!!!!) beat the Arizona Cardinals in the pre-season game Saturday night. Sunday was our typical fun-filled day of breakfast with the father-in-law, and a trip to Wally World. After Wally World, hubby’s boss called (from out of town) to ask if hubby would help his (bosses’) wife replace the battery in their truck, as she was stuck at home up the mountain without transportation. I stayed home while he went to help, and I repotted 4 plants and ran the vacuum. My housecleaning is done for the week. LOL. Do you have to have hard-cold facts to believe something, or do you just know with your heart? Both. Depending on the subject or situation. l’m a pretty good judge of character, and can usually determine whether or not I like someone the first time I meet them. I generally don’t know any facts about them, and base my opinions solely on the feelings, or vibe, I get upon that first meeting, and I’m usually right. Of course, I don’t always heed those first feelings, and later learn facts that reinforce my original beliefs, and then I have to go through the inconvenience of righting my wrongs. Case in point is my first marriage. I knew getting married to my ex was a huge mistake, but I did it anyway. Call it woman’s intuition, gut instinct, whatever. All my warning bells told me it was the wrong thing to do, but I didn’t listen. After gathering facts, 13 years of research, I knew I had done a very stupid thing, and beat myself up for not listening to my instincts when I had the chance. So, I had to go through the inconvenience of righting my wrong and got a divorce. Largely because of that huge lapse in judgement, I always trust my instincts now. Of course, there times when facts are necessary. I spent many, many years working in an industry where facts were the lifeblood of our daily work. I cyan’t do the job I have now properly without knowing all the facts about situations. Anyone can believe in something if presented with the facts, but I’ve discovered that not everyone believes with their heart. What are three things you know 100% to be true? I thought about this topic for a long time before I decided what to write. I wasn’t sure what direction I wanted to take with this post. I could take the easy way out, listing obvious things that I know to be 100% true, such as the sun is hot or the grass is green. Or, I could be personal, listing things like I know 100% that I love my family. I am blessed. I’m married to my best friend. I have wonderful step-sons, grandchildren and fur kids. I have a great, albeit frustrating at times, job. I have awesome friends. I love where I live. I love life. When one door closes, another one opens. This may be cliche, but it is true. It’s happened to me many times, primarily in jobs and relationships. I’m not perfect. Shocking, I know, but true. There is always room for improvement. What are three things you know to be true? Well, this weekend is coming to a close. As usual, it was too short. We decided not to go to my work get-together Friday night. Instead, we spent time with my stepson and his girlfriend. We went bowling, although I did not bowl. Long story, but I can’t physically can’t bowl. But, I watched the hubby and the kids bowl, and we had pizza and beer. After bowling, we went into the bar at the bowling alley, and my future daughter-in-law and I played some pool. I haven’t played pool in years, and I’d forgotten how much I like to play. We will definitely be doing that again. On Saturday, my good friend was having a yard sale and we spent the day helping her out. When we were packing up at the end of the sale, I got tangled up in the tarp we had the clothes laid out on. I tripped, and came down hard on my foot when I caught myself. My ankle was already sprained, and I have a ripped Achilles tendon for which I’m doing PT, so this didn’t help matters any. I broke my toe, and I’m pretty sure the sprain is now much worse than before. We were supposed to go to a friend’s place on Saturday night, but I was in pain and hubby didn’t feel well, so we begged off. I fell asleep on the couch and slept about two hours before I woke up and went to bed. We go to breakfast with my father-in-law every Sunday, and today was no different. It’s practically the only time he gets out of the house, so we try not to miss a Sunday. After breakfast, hubby and I went to Wally World, always a fun adventure. We didn’t do much this afternoon, just took it easy, watching a bit of TV and doing laundry. I worked on my blog and did some writing, and finished Harry Potter and the Chamber of Secrets. I’m reading the series for, I think, the 4th time. We’re getting ready to call it a night, so that we can be ready for work in the morning. So, fair readers, I bid you all a good night.